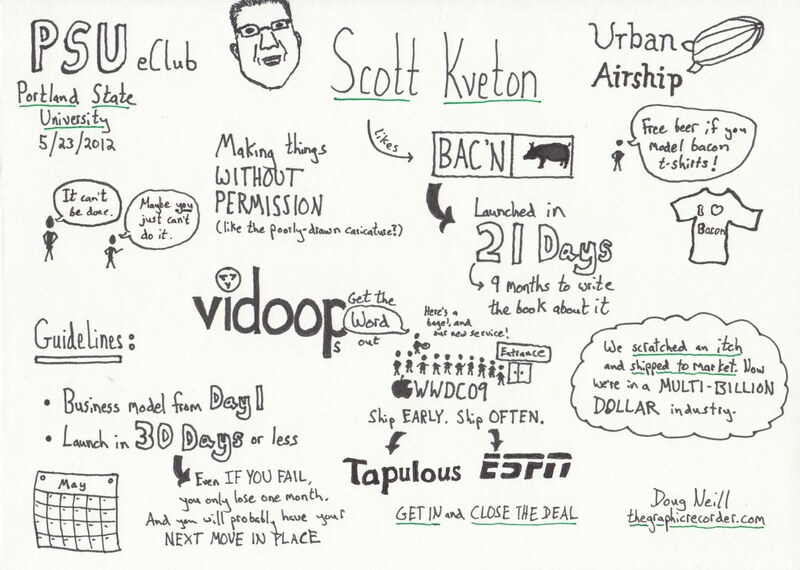 Scott Kveton, the CEO and co-founder of Portland-based Urban Airship, gave a talk to Portland State University’s Entrepreneurship Club earlier this evening. I attended the public lecture with two objectives in mind: 1) learn what Kveton has to say about entrepreneurship; and 2) see if my sketching skills are up to the task of live graphic recording. The biggest take-away from the talk: hit the ground running. More specifically, launch in 30 days or less. If it takes you longer than that to get your startup off the ground, you’re probably doing something wrong. And if you’ve got an itch, scratch it and see where it goes. The first itch that I scratched: starting this website. Since it went live (within 24 hours of having the idea), new itches come up every couple of weeks. I’m scratching them as hard as I can. After listening to Kveton’s talk, I headed over to PSU’s Native American Student and Community Center for a seminar on conservation. Check out my sketchnotes from that seminar.